SHAME ON SMOKE FREE ILLINOIS! 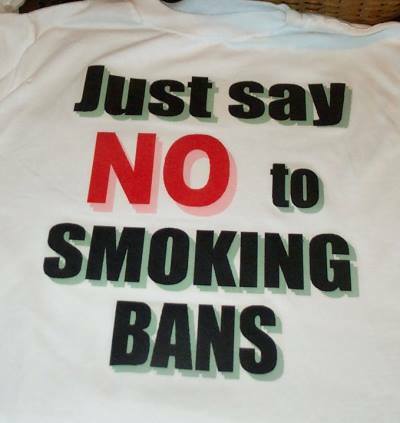 YOU can HELP fight the anti-smoking propaganda with T-shirts! PLEASE FORWARD & CROSS POST to interested people. Hello, I have a fairly new project that is having quite a bit of success, and I know that some other folks are 'arts and crafty' like me, so they might like to join in! I have recently been making T-shirts, using the computer forms for printing iron ons (economical at Sam's Club), and inexpensive t-shirts you can get at Hobby Lobby, Michaels, etc. I've been giving them away to folks who promise to wear them, as I travel with the Liberty Van. They are EXCELLENT for wearing to government smoking ban meetings, as usually the rooms will be packed with those wearing 'SMOKE FREE whatever' shirts, paid for with ACS/RWJF money and/or OUR cigarette tax dollars. I've started wearing mine almost every time I'm out in public. Although I've been giving these away, some folks ask if I want something for them. I tell them any money anyone contributes will be used for more t-shirts, computer ink, and iron on forms, so my t-shirt project is nearly self financing already, as people LOVE them, and some do contribute, and a few have been quite generous. Probably could sell them (you could if you want to), but my goal is to get AS MANY AS POSSIBLE OUT in public view, so generally I am GIVING them in exchange for a PROMISE to WEAR them in public. I AM using ALL $ contributions for them to buy stuff to MAKE MORE SHIRTS. : ) I distributed about 15 more of them in Nashville TN last night, where I went to cruise a bit with the van to celebrate George Washington's birthday. I have created a MS Publisher file with many graphics to be used for these shirts. In order to make most efficient coverage of the iron on forms, also to minimize blank areas on the forms, the elements are cut out, so can be used in any arrangement you like. In other words, you don't have to make your shirts with all the things I'm using, you can pick and choose and set up your own designs. I would be happy to share that file, plus information about how to make these shirts for anyone else who would like to make and distribute these t-shirts. If MS Publisher doesn't work for you, I can probably put them in a Word document (or something else) for you, or send you the picture files so you can use whatever printing program you like. In addition, this file also has many of my very popular stickers, which are a good size to iron on pockets, etc. We are in a PROPAGANDA war, and they think they can 'create their own reality' just by dumping enough disinformation out there to influence people's beliefs. One HUGE area is all the lying about health, using junk science statistics. Another BIG LIE is that 'there is no opposition to smoking bans'. It would be FABULOUS if folks started wearing t-shirts - these or something similar, to let people know there IS opposition to the bans, even if the news media carefully AVOIDS publicizing most of it. We need MANY more folks to TAKE A PUBLIC STAND against this. Here is a way for those who (like me) enjoy the 'crafty' thing to help. Basically, have been buying the shirts at hobby lobby or Michaels for 3.99-4.99 - get them on SALE if possible. I bought lots when they were 1/2 price <G>. Also, thinking of doing a net search, maybe can buy them in bulk somewhere for even cheaper? 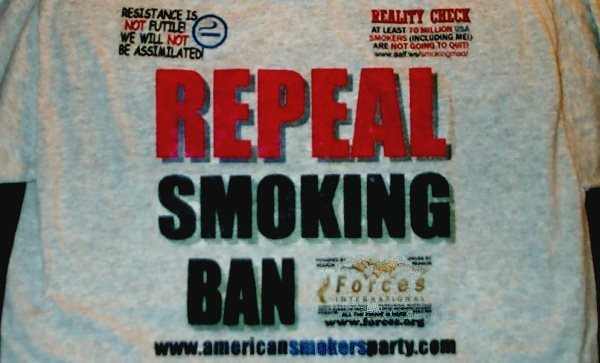 I've been wearing one, and sitting right in the front row of the smoke ban council meetings I've been going to. At Bowling Green I got my daughter and her new husband to come and wear them too, BG voted down the ban 3-2. I was the only one with one at the Clarksville, IN meeting, but they voted ban down 7-2. Note - always use a web address, so people can go get more info. You don't have to use the ones I'm using, if you have a good website for your local folks? I can fix you up a graphic for it if you want, just email me jlfarley@scrtc.com . For the iron on, you want to minimize white space, that's one reason I've used the blocky type fonts I have, also used the shadowing. Then you can just cut close around without having to do a lot of tedious close cutting between letters, and it looks good. PS - I NEVER buy ANYTHING in a smoking ban area if I can avoid it. 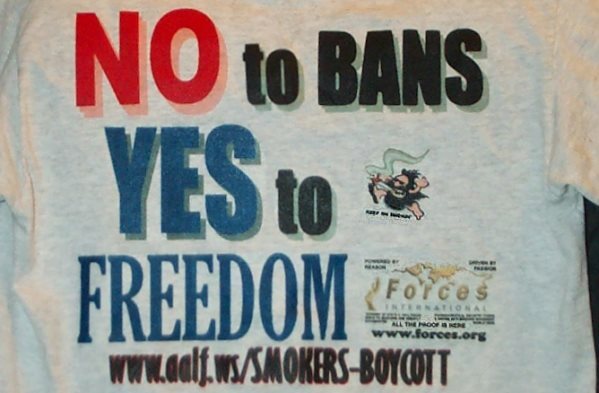 Check www.aalf.ws/SMOKERS-BOYCOTT/ for list of ban states and cities. However, I don't have all the ban cities listed, and they keep changing. If you live in a ban state, try to order from the internet from a NONban area, or if possible go shopping in another area. I now have ALL the MS Publisher files on CD with all these graphics, PLUS MORE, and the instructions to MAKE YOUR OWN smoker's t-shirts! I also put them into MS Word files, for those who don't have Publisher. If you would like to send postage, or a contribution toward this effort, www.paypal.com jlfarley@scrtc.com, and note it's for t-shirt CDs.